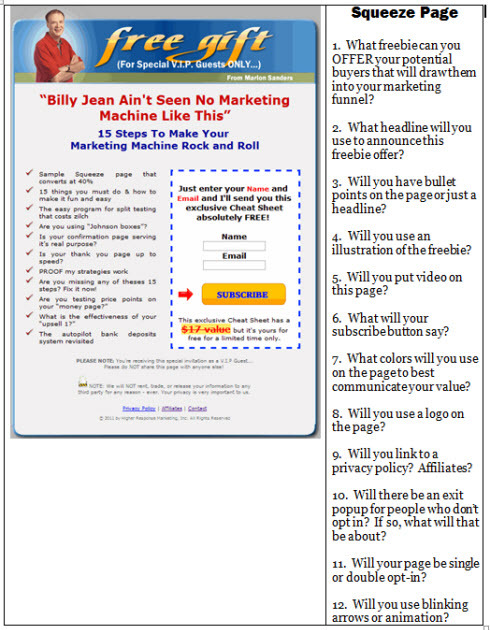 It’s going to help you plan out your Marketing Funnel for sales and profits. Before I tell you about it, let me share this: Each week on Saturday morning I publish my newsletter that is sent to you via email. I call it an ezine because it’s sort of a cross between a magazine article and email. The thing that makes me DIFFERENT from other online marketers is I show you how to promote a product, service, business, idea or cause via Internet marketing. Most marketers only focus on “make money now” or “get rich.” But I realize many people have a vision, a cause, a purpose. They want to HELP PEOPLE and it’s not all just about making a bunch of money fast with no work. The process I’m going to show you below works for marketing a product, service, idea, group or cause BECAUSE the one thing you do is get them on a LIST. Are you a non profit? You need to get your potential donors on a list. This is nothing new to you since you’ve probably done direct mail in the past. Are you selling a SERVICE? Your customers and potential customers need to be on lists so you can send them emails about your new services and offerings. Are you marketing a GROUP? The ability to communicate with members and potential members is absolutely critical. This is how you get participation, interaction, attendance and involvement. It’s how you make group functions known. 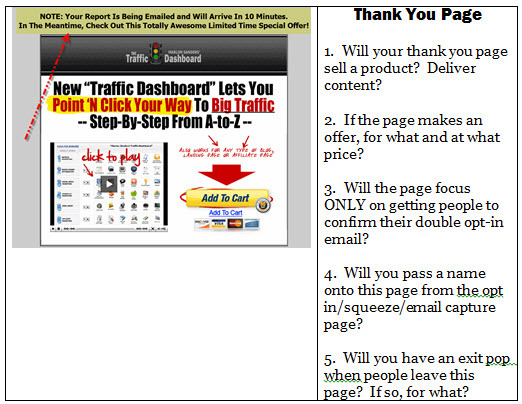 The reason is that new people come into your marketing funnel via the squeeze page. That’s the first page on the above graphic that says “Free Gift” at the top. They enter their email address and possibly their name. Then they go to your thank you page. This can be a video that delivers the information promised as the free gift THEN makes a pitch. Or it can be a page like you see above that has an offer on it. This offer is CRITICAL to your marketing because it’s the tool you use to break even on your ad buys, or at least liquidate as much of the costs as possible. The next thing you see is the confirmation message. 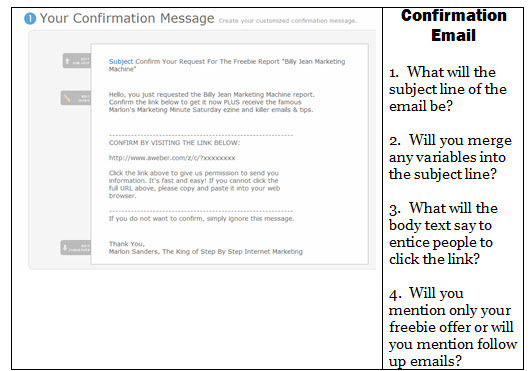 This is sent via email and requests the potential buyer to click the link to confirm their subscription to your email. In marketing terms, we call this “double opt in.” People enter their email address THEN confirm their desire to receive email. This is to prevent someone from getting subscribed to your list by someone else with ill intent. Next comes the download page. This is where the new subscriber downloads their free report or video. The download page is a great place to feature a few banners for other offers of your own, affiliate offers or banners from JV partners you’ve done banner swaps with. At this point the subscriber gets your PDF or video and watches or reads it. You’ll likely refer to a few of your other offers in it. Finally, you have your follow up messages. Let’s assemble YOUR marketing funnel now. The thank you page is what the subscriber goes to IMMEDIATELY upon subscribing. Then they get a confirmaiton message. It’s an easy link to remember and pass along on Facebook or Twitter to friends, which you might find yourself doing right now. 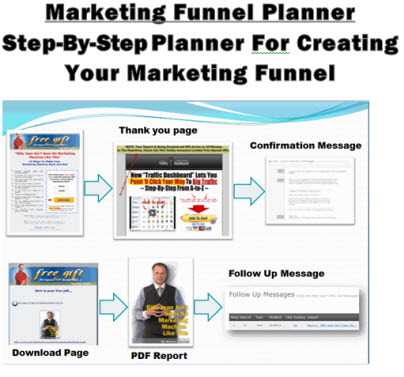 So click here to download the complete marketing funnel planner PDF, complimentes of me.